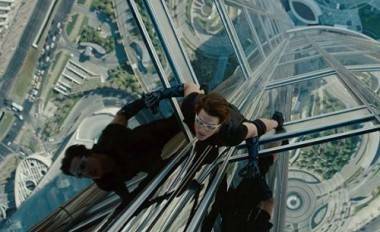 49-year-old man Tom Cruise climbs a building in his new movie. Sherlock Holmes: A Game of Shadows continues director Guy Ritchie‘s obsession with gypsies and “zee Germans”, and his late period prediliction for mediocrity. Seemingly rocked onto his heels by all the parts of Rock N’ Rolla not featuring Thandie Newton, Ritchie gives us a Holmes sequel with most glaring issues covered by cloyingly charming cast led by Robert Downey Jr. Like much of his post-narcotic work, Downey Jr. (and the underrated Jude Law) is failed by an overstuffed script and a director obsessed with making things look like a Mythbusters stunt in slow-mo replay. Adding Jared Harris (Mad Men) to play Sir Arthur Conan Doyle’s Darth Vader equivalent, Professor James Moriarty, you would expect a dangerous battle of wits to play out in cracking fashion on-screen. Always playing with expectations, Ritchie instead treats us with some of his most yawn-worthy action set-pieces, only partially made up for by some excellent character work making gallons of lemonade out of a lemon-heap screenplay. The chemistry between Downey Jr. and Law make a night at this film not a total write-off, but there’s little here to justify full ticket price. The original girl with the dragon tattoo Noomi Rapace is again failed by boring subject matter, but we can hope this is her first step toward filling the “vaguely ethnic hot girl” niche in Hollywood so long left empty by Selma Hyek. Mission Impossible IV: Ghost Protocol – This is getting overwhelmingly positive reviews and being called the best action film of the year. It was directed by Brad Bird who made the great Iron Giant and stars 49-year-old man Tom Cruise who climbs the world’s tallest building. Jeremy Renner shows up, and Simon Pegg collects a handsome paycheck for smirking and yapping. Pass the popcorn. The Adventures of Tintin – The European comic book character gets the Spielberg treatment. Apparently this animated feature is full-on entertaining until it isn’t. There are worse things than being entertained to exhaustion, we suppose. The Girl With the Dragon Tattoo – Wasn’t this just out? Didn’t we just read this? Wasn’t this just on TV? Didn’t we just eat a bowl of dragon tattoo cereal? Never has such thin material sold so many books and been made into so many movies in so short a period of time. With Daniel Craig and Rooney Mara. We have a feeling this scene insn't in the movie. Young Adult – Charlize Theron, Diablo Cody, Jason Reitman and comedian Patton Oswalt (who showed up at this year’s Whistler Film Festival to accept an award) are involved in this dark comedy. Alvin and The Chipmunks: Chipwrecked – Sure, it’s not aimed at adult film critics. But even so, kids’ movies that entertain adults as well as children are possible. Currently at an underwhelming 10 per cent approval rating, Chipwrecked is “uninspired and completely forgettable,” according to the San Francisco Chronicle‘s Peter Hartlaub. This entry was posted in Homepage Features, Movies and TV and tagged Movies and TV, reviews, Tom Cruise. Bookmark the permalink.